အခုလို ေနာင္မ်ိဳးဆက္ေတြ သိေအာင္ေျပာျပေပးတဲ့ အတြက္ ေက်းဇူးပါ..
ရင္ထဲမွာ တဆစ္ဆစ္ နာက်င္လာတယ္ အမရယ္ ..
စုလတ္တို႕ တိုင္းၿပည္က သူရဲေကာင္းေတြအတြက္ ဂုဏ္ယူမိတယ္၊ေလးစားမိတယ္၊ၿပီးေတာ႕ ရင္လဲနာမိတယ္အမရယ္..
ပို ခံစားေၾကကြဲ ရေပမယ္ မခ်ိဳသင္းရယ္ ..
ေခါင္းေဆာင္ပီသတဲ့ ၈၈ ေက်ာင္းသားမ်ားကို ဒီေနရာ ကေန ဂါရ၀ ျပဳလိုက္ပါတယ္ မိမိရဲ ႔ တိုင္းျပည္ႏွင့္ လူမ်ိဳး အတြက္ အသက္ကိုေတာင္ ပဓါန မထားပဲ အမွန္တရား သစၥကို ကိုင္ဆြဲကာ တိုက္ပြဲ၀င္ေနတဲ့ ကိုေဌးၾကြယ္ကို ဒီေနရာကေန ကန္ေတာ့လိုက္ပါတယ္ဗ်ာ.. This is my first comment on your blog, I wanna write something about Ko Htay Kywe, I met with him 4 or 5 times in person during 2006, 2007. As you said, he is a vsoft spoken ,a good speaker and a very determined person. He can speak very well not only in Myanmar but in English. 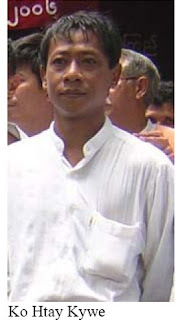 He and Ashin Gambira really can lead in 2007 uprising when Min Ko Naing and others are arrested. Most of his time are in prison, but he learned and studied a lot when he is out of prison, we sit teashop together 3 or 4 times together, and I helped him for some confidential things as much as I can. We lost contact each other when I started working for one NGO as I was busy and he might think I was afraid to contact him. He understand well about normal people and he never ask my phone number and give his number. The last time I saw him was July, 2007, he is under close eye of SB, intelligence. When I was sitting and drinking yoghurt with my friend, I saw him on the taxi and tried to greet him. He dropped off and sat with me and just talked about personal things. He might have something to talk to me at that time, but I did not ask anything at that time and I feel regret for that now. I should have asked him how can I contact him and I could help him when he was hiding. At that time, when I heard his interview on radio stations, I am worried a lot for him and I wanna give a shelter for him but I don’t know where he was. Because I am not from a political background, I think I can help him and no body can trace .But now all is over and I feel sad because I did not ask him for how I can help him when I met with him last time. စစ္ဘိနပ္ ေအာက္မွာ ျမန္မာ့သမိုင္း ရိုင္းခ်င္တိုင္း ရိုင္းျပီ. I am Roi Sawm (from Prestige) who went to the same class with you around 2001. I found this site and very happy to see you again after all these past years. I have no idea how to contact you, so I wrote it here. Please find out who I'm.